I knew this wedding was going to be one for the books right away. 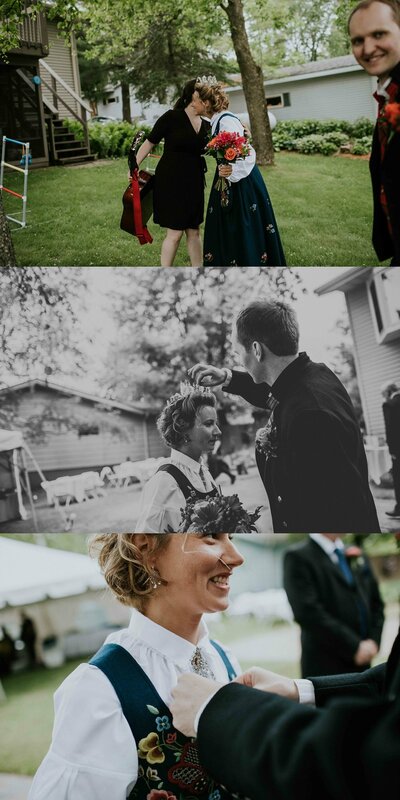 Sarah and Anders got married, surrounded by their closest friends and family, next to the river in Sarah's mother's backyard. It was overcast and cool (my absolute favorite kind of weather). 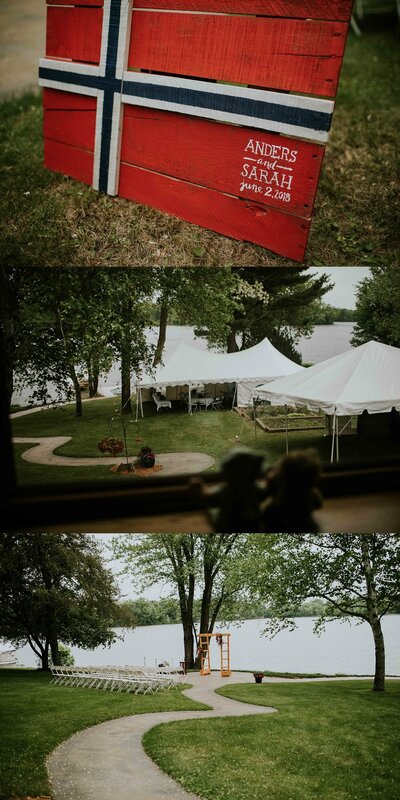 It was laid back and intimate and there were so many cool details incorporated into their day. 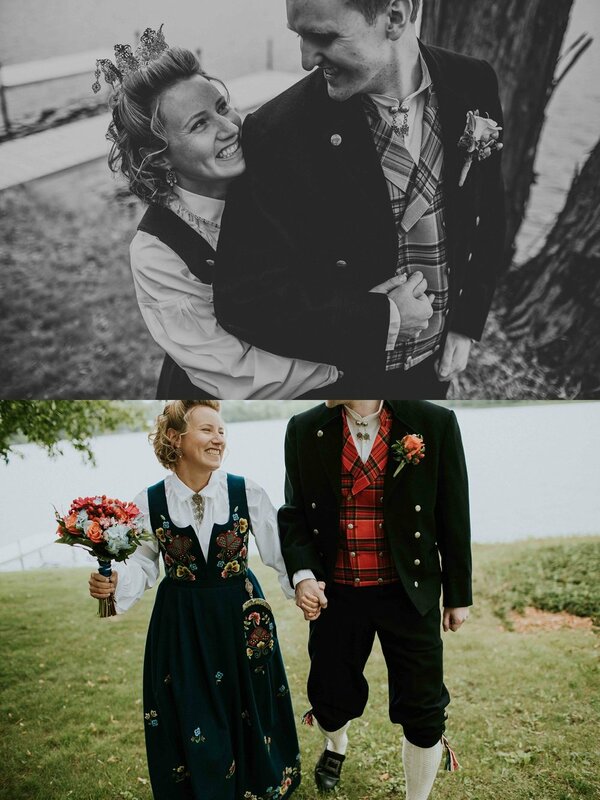 Sarah and Anders met on a cross country skiing trip and they've been walking through life, hand in hand, ever since. Anders loves that she gets excited about everything big and small (like sprinkles). Sarah loves that he's steadfast and adventurous. Even though they've been separated by thousands of miles because of school and work, it's only made their love stronger. Everyone around them speaks so highly of them. Sarah and Anders are both smart and love to travel. They're the type of people who excel at everything they do, but the thing they're best at is loving and supporting each other. Anders is Norwegian so he and Sarah opted to wear the traditional bunad. Sarah's dress was handmade in Norway. I think it might possibly be my favorite to date. For the record, I one hundred and ten percent encourage couples to walk down the aisle together. This ceremony was so personal and heartfelt and perfect in every way. It makes me really happy when couples take the time to really plan out this part of their day. I mean, that's the whole reason the day is happening. Make sure your ceremony is meaningful and special and true to you. There was no shortage of adorable children for me to hang out with. So that's a plus :) It rained on and off throughout cocktail hour and dinner but honestly I never did mind a little rain on a wedding day. I tried to learn as much Norwegian as I could but the only thing I really remember now is "Skal!!!" aka what you shout before you take a shot. So really what else do I need to know? Sarah's friend Anna read this passage from The Velveteen Rabbit during the ceremony. I could barely keep it together then and every time I've read it since the affect is the same.